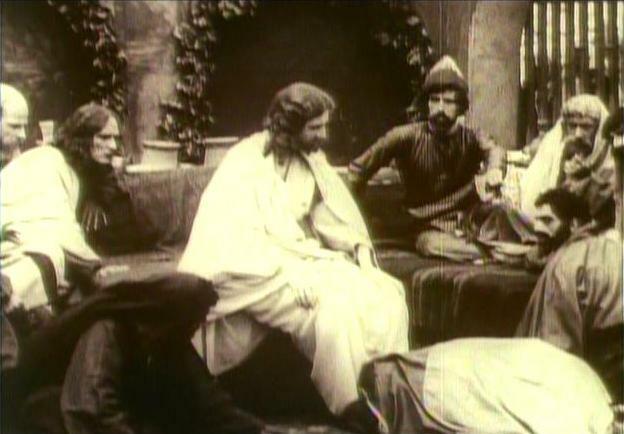 Having mentioned this film a number of times so far, most notably in my Top Ten Jesus Films post and in last week's post in the re-issue under the alternative title of Jesus of Nazareth (1916). As this is a silent film, all the dialogue is obviously conveyed via the intertitles. In this film's case these are accompanied with bible references. This makes the task of referencing the film's scenes and dialogue a little easier, as well as ensuring they are in line with the film-makers' intentions. So I'll forgo the usual citation method in favour of the film-makers' references. Where consecutive verses are separated by a comma this signifies that they appear on separate cards. The words in bold are from separate title cards which introduce each section. I believe these headings are imposed on pictures from Tissot's illustrated bible. Notes*Two of the references given on the cards are wrong (as indicated above by asterisks. The first is cited at Mark 20, whereas the second is cited as Matt 31. 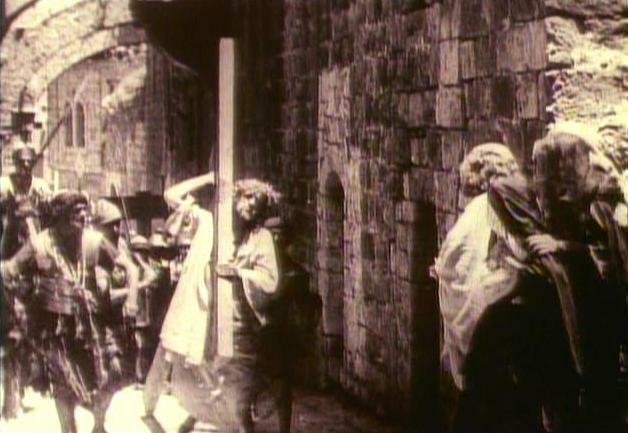 This is possibly the only Jesus film to show Jesus parading through the streets of Jerusalem with a T-shaped cross. Although a number of films show the two thieves crucified either side of Jesus on such T-shaped crosses, Jesus is always crucified on one that is the traditional shape. Jesus (1979) also proved something of a watershed here, being one of the first films to show Jesus carrying the cross beam alone, as has been shown to be more historically likely. 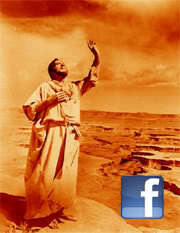 Since then the majority of Jesus films have followed suit - although The Passion of the Christ is a notbale exception. In either case, the cross itself is always a † shape in all other Jesus films. As I noted when looking at the re-named, re-issue of this film Jesus Christ Superstar (1973) was heavily criticised by Christian groups when it came out because it omitted the resurrection. Yet note that this was not a new thing, both the earliest passion plays (which were focussed solely on Jesus's suffering), and this film (which shows more of Jesus's life but tells the story up "to the cross" as per its title) this was far from a new thing then - it goes back to the very start of cinema, and indeed, older Christian tradition. 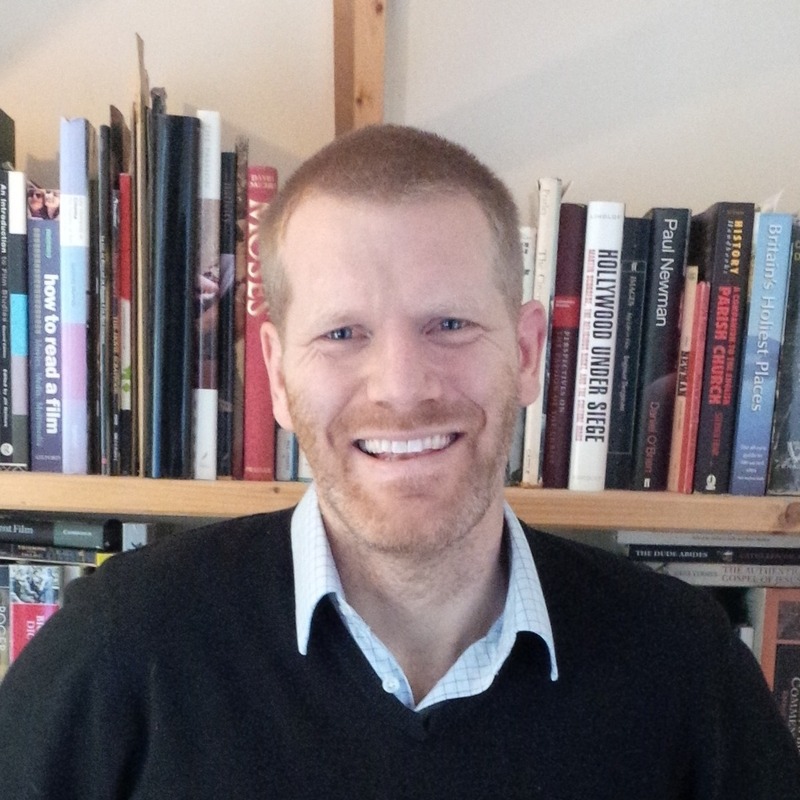 The truncated ending, and the film's emphasis on the works rather than the words of Jesus, have led many to find similarities between this film and Mark's gospel in particular. 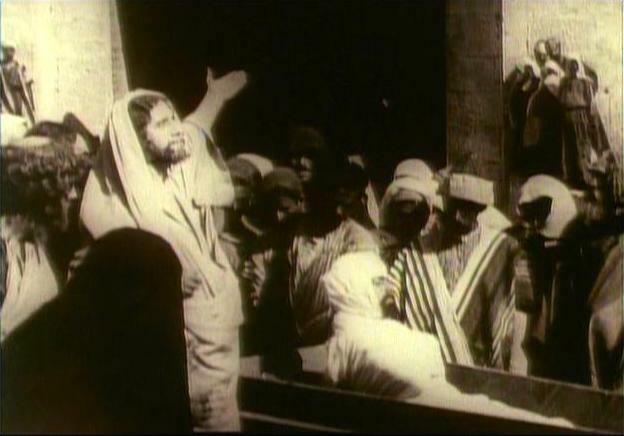 The healing of the Widow of Nain's son (picture right) is one incident that is ot included in many Jesus films, only this film, and Jesus (1979), although it is also included in episode 6 of the Living Christ Series. I can't recall a film that shows either this raising, or that of Jairus's daughter but omits Lazarus's, other than those based solely on one gospel. Similarly sparse are films which show Jesus washing the disciples' feet, although this has increased in recent years with The Gospel of John (2003), and The Passion of the Christ (2004). 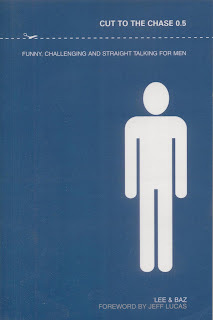 Prior to that, I can only recall this film, Il Messia (1975) and the Living Bible Series. Of all Jesus films, this one is perhaps the one that shows the greatest range of Jesus's childhood in the "Period of Youth". Obviously a great many films show the birth and the incident in the temple when Jesus is 12. A few also include the return from Egypt. This film also shows some very naturalistic footage of Jesus growing up, with his mother as a toddler, both parents as a young child, and then helping his mother around the age of 10-12. After the temple incident, we see him helping Joseph carry some wood. The brevity of these scenes, no doubt due to what seems to us a short running time, but was then one of the longest films ever made, help this natural feel. They are wordless, and are of every day tasks. Another shot achieving a great deal of naturalism is the one shown at the top of the post where Jesus prays on the Mount of Olives. One curious aspect of this film is the way it includes two different versions of women anointing Jesus. This, like the two accounts of Jesus clearing the temple in The Gospel Road, is unusual, both amongst Jesus films, but also as an interpretation of multiple, yet variant accounts of similar incidents in the gospels. Most scholars would consider there to have only been one anointing, with the author of Luke relocating it - presumably because it fits in with the surrounding incidents, forming a section focussing on those outside "respectable" Jewish society. John's relocation of the story to Lazarus's house in Bethany, and naming of the woman as Mary, either reflects and alternative tradition, or most likely is to strengthen the link between Lazarus's death and resuscitation and Jesus's coming death and resurrection. W. Barnes Tatum in his analysis of the film in "Jesus at the Movies" comments on how the screenplay, written by a woman Gene Gauntier has a very positive view of women, omitting incidents which portray women as harlots and seducers, such as the woman caught in adultery from John 8 and the dance of Salome, and including incidents which show women in a more positive light such as the two anointings, Mary being praised by Jesus for sitting at his feet and learning from him. Gauntier also played the Virgin Mary. The film also omits any kind of "trial" before Caiaphas or the Sanhedrin, perhaps to remove potential anti-Semitic incidents.